The first time visited the Grand Canyon I found it to be completely filled with clouds. The scene stuck with me and inspired this render many years later. It has always been one of my favourite backgrounds. Currently on my desktop. Very cool. From the site it looks like waterfall between the rocks until you open it up and realize...it's clouds! The hidden sun poking through the top left gives it just the right touch; you're not left feeling closed in and locked to the midpoint perspective lines. I love the sepia and golden colors used here. Also the illusion of clouds flowing down over the rocks into the canyon like waterfalls is very cool. One of my favorites! 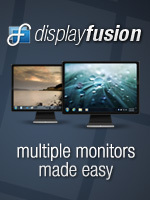 "Found this image in use on AnandTech.com"
AnandTech is an excellent hardware review website. It would appear they also have great taste when it comes to wallpaper. awesome picture.... truly has great colour and detail is amazing. The color composition and the clouds are to die for. But the geologic layer lines are too conspicuous and continouous. They should be subtle and broken at times. The thinner "towers" in the middle exhibit 90's euclidian geometry, and need to be more jagged. Very cool wallpaper otherwise. An excellent image. I find my eyes drawn towards the gaping chasm. The detail is so crisp and clear. Superb work with lighting and contrast! It draws the eye in to the sharp detail. Your work with atmospheric effects is brilliant. The realism of this image surpasses most still life photography and could compare to real life itself. Rarely has an artist been able to achieve this feat. On the slightly negative side, the rock peaks are too similar in appearance and in my most humble opinion, should be uniquely shaped. In all, this is a very stunning piece. You can download the images to your computer by viewing the image you want, then right clicking on the image and select "Save Image as". It will then prompt you for the location that you would like to save the image. I like this and the earth with the lightning bolt. How do I download these and other images, new and old? I love the crispness of this image. absolutely breathtaking. this is one of my favourites you've ever done. A Breathtaking render. Keep em coming!!! Ryan, i thought it was a waterfall, when first looked at the thumbnail) Exactly the same feeiling. I think it will be great if you create waterfall. it will be natural Blasphemy! I really like this 1 picture. For me, it is one of the best. My favourite is "Song of the sky", your work of 2000. "Hey by the way.... "
Hey Ryan, I was looking at the thumbnail of this and it looked like... a Waterfall... Have you ever done a waterfall?? Might look beautiful with the new fog/mist you are exploring. Longtime member and I have to say, this is one of the more breathtaking images you've created. Absolutely beautiful!! Keep 'em coming Ryan!! The most recent images made with Vue Infite are very promising for the future, because Cloud Canyon is �lmost like a real photo, i would say about 98%. The level of realism you achieve with Vue Infinite is no doubt a big improvement - and I was already a great admirer of (most of) your earlier work. I've had at least 3 people walk in and ask where that is. One person didn't believe that it was created until I pointed out the name of the site in the lower right. I have had more people comment on this wallpaper then any other picture from you I have had up. People come in and say ohh... nice. This one could easily become one of my all-time favorites. Maybe it already is! I like the night version of most wallpapers, but I don't agree that this wallpaper should have a night version. 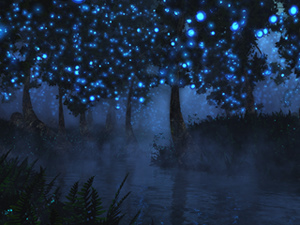 There simply aren't any good sources of light that could be added to the setting in a night atmosphere that would still allow to show all the detail. Maybe a dual-screen version... expanding more the central details of the picture, but leaving the walls on the edges... but that's asking too much. once again, excellent work! your imagination and talent still amazes me. make a night time version !! the atmospheric system is simply amazing and your skill with it is not something i would contest simply cause it is so appearent that you try your hardest with all your work. i keep getting reminded why i paid for this site ^_^ great work! I agree the bands around at the cliffs looked a bit too artificially straight and even to me. I know these types of layers are found naturally in rock formations, but the ones in this picture still seem too clean and perfect to me. Otherwise, its a very nice picture, and I really like it. "I like it because it's different"
I like this image a lot because it's a bit different than a number of Ryan's more recent works. There's no plant life, and no cool colors. It has an interesting perspective as well. The picture has a lot of depth and looks very natural. Really good. I have seen rock formations that look alot like these when it comes to the different layers. I'd say this is your best cliff/canyon picture in 3 years. Nice, but I think the cliffs textures are a bit too "stripey" for my taste. I was just thinking though, it would be neat to have an eagle soaring over this scene in the distance. My favorite scenery pics of yours are the ones that have those little extra touches like that. Some of my favourite images are your canyon/cave type designs and this rates up there with the best, I feel. I just want to tilt the screen to see what's down in the depths! "Re: Great How It Is"
Perhaps a night version does not have to take away the magic - there can be moon lighting effects, or a sunset (red) version. A moonlight version can make this place more spooky than it currently is, may be nice. The more I look at it the more I think this is your best picture yet. I wish I could change my vote from a 9 to a 10! I think this is just right. A night version would take some of the magic away (like the sun lighting up the low clouds), and I think a person/plant/bird would be a bit out of place. Absolutely amazing - looks like something from a dream and reminds me of the Myst video game series... in which you expect something almost magical to emerge. Great job! This is an amazing use of the atmospherics in this program. 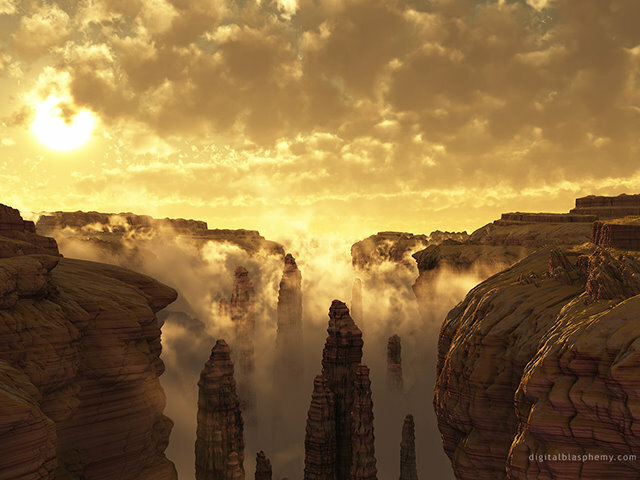 I like the canyon walls and precariously stacked pillars, but the true star of this piece is the clouds and fog. I imagine that these programs are geared towards creating still pics, and would be ridiculously time-consuming to render a whole movie, but do you still make animations on occasion to capture some images? I doubt this would be the case due to the resources needed to perform this, but if so, it would be wicked awesome to see some new animations, especially of this quality. The detail is amazing, and the colors are bright without being garish. Its work like this which makes me want to go out buy a monitor with a resolution which could really show off a wallpaper of this supreme quality. I absolutly love it. I'd love to see a night time version as well as dual screen versions. A night version would be AWESOME! I really like this one, looks great. The way the clouds look inside the Canyon give the overall image a great look. Keep up the good work! I quite enjoy the little bits of detail you really have to zoom into the pic to get to see!. There is a bright spot center near the bottom where the light is striking a point of rock. Makes it look like a dead pixel on my monitor. To me, the color bands in the canyon walls look a little too artificially straight. But it is still very spectacular, especially the sky. I really wanted to give this one a 10/10, it was so spectacular that I was breathless when I first saw it. Unlike the posters below I don't think it looks symmetrical at all, and the contrast between the dim cliffs on the left and the lit rocks on the right helps to distinguish them and show features in the rocks on the right. My only gripe with this image, and what prevented me from giving it a 10/10 is that the pillars in the bottom centre of the image seem much too wavy to me. I would imagine they'd be smoother than that since they would have more exposure to the elements on all sides. This is the first 10 rating i've given on your works, this is the best by far! Realistic clouds, fantastic quality and the great idea! 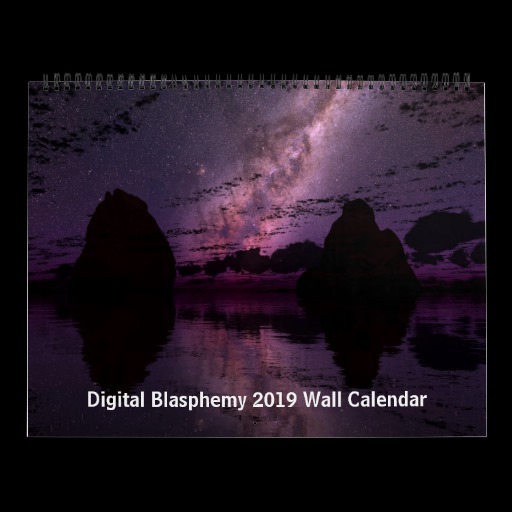 Now i'm sure, you called your gallery Digital Blasphemy, just because it is! Guess everyone, who is the only 1 Creator? Who is the God? Sure, Ryan Bliss is! Thank you! You absolutely changed my vision of world since November 2006 when i first came here and signed up in December, as a New Year present for myself(best present ever)! p.s. will tell every of my friends here in Russia about a new great image! Ryan, you are my god. You've seriously outdone yourself on this one. Absolutely beautiful scene! this image is ssoooooo cool. so real, yet so unreal. i'll probably have this as my background for like the next month. i don't think you should put a person in there, it would ruin it. maybe a bird, because it kinda does need a sense of perspective, but not a person. I'm having a hard time putting my finger on exactly what it is about this particular piece... For one thing the clouds are perfect. Same for the mist. The sunlight on the rocks in the right foreground really make them jump off the screen. It's got that better-than-reality clarity and vibrance. The latest in a long series of excellent renders. This is a potential 10/10 but (as odd as this will sound) there is something a little claustrophobic about it, which I noticed as soon a I put it on my desktop. Someone else mentioned the symmetry issue, maybe that's it. The way all one's attention is drawn into the middle. I love the landscape but I would like to see it from a different vantage. Yes, very nice indeed - I gave it an 8. To me it looks like a vulcanic canyon. When I clicked the thumbnail to see the full image, the first thing I did was to scan the image for a bird or a man. I miss the scenery images with a Poser model. I thought that it would be nice to have a man in a cape on the rightmost ridge, like in elevado (2002), or even a single plant - something to break the monotony. But nonetheless - this is special and fascinating. Would be interesting to see the dual/triple versions. "oh i forgot to say"
this is the greatest image you've ever made !!!!!! i will become a lifetime member because of this !! I am not a big fan of landscapes but this is truly one of your best. "You had me at "hello""
Man Ryan, this just helps reinforce what I tell anyone who sees your artwork on my computer...you are one of the best background artists of our time. Bravo! I did not expect you to top your last work, Ryan. I like what this new software has allowed you to do with the sky. My only critique, a minor one, is that the lines of the texture look too regularly horizontal. Definately one of my favorites/your best works yet! It's a really cool concept and the gold hues look great. "I'm rating this one very high"
This is a simply amazing render. I love it! The texture on the rock is amazing. Seeing the thumbnail your new piece looked a little like a waterfall however on opening it I was blown away. Your recent pieces really have been something different. Its evidently a very powerful piece of software andi n your hands things can only get better. My only gripe isn't really something thats wrong with the image but more out of taste and that involves the rocks theres something I don't like about them but I can't put a finger on it. I'd have tried this experiment on a jungle scene with massive ancient trees and the clouds / mist between. I guess you had touched on this with Morning Mist. As a potential suggestion, how would the image look if the sun was moved into the canyon itself? The combination of rocks and clouds would make some awesome rays / shadows. Also then the image could be panned down slightly to focus more on the void. Excellent work Ryan, keep going! The color contrasts are fantastic! It looks amazing as my background to Vista, the colors themes happen to work well together! Great Success! These last two pieces have been truly spectacular. The clouds are incredible, and the center feels so vast, I love it. The sides seem a little close, maybe a little too symmetric, I'm not really sure what it is, and I think that might affect the multi screen versions, so I'm anxious to see what you do with those. But as a whole, I think this is another amazing picture. The clouds!!! Great work!